Zoom’s flavor injector system is revolutionary. Simply add a marinade to the top cylinder and give it a push. Zoom’s 50 flavor pins tenderize the food and inject flavor deep inside. 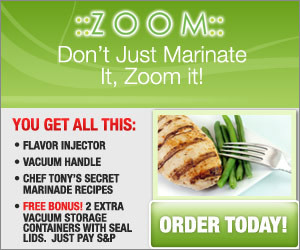 Zoom also creates a vacuum, so flavors penetrate deep inside in just minutes. Zoom is great for the barbeque, and it’s dishwasher safe! It gives all your meats, fruits, and vegetables great taste in just minutes.